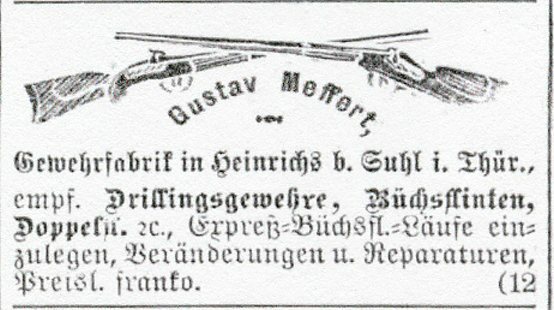 The Meffert family has a long history of Arms making in the Suhl vacinity. Hans-Jürgen Fritze in his book Heimat der Büchsenmacher notes that a Claus Meffert is listed as a gunsmith in 1606 and in 1631 the lock maker Baltzer Meffert and Casper Meffert are mentioned. In 1753 Zacharias Meffert’s widow and son lost their workshops in the Suhl city fire of that year. Little is known about Gustav Meffert and his Gewehrfabrik in the small town of Heinrichs near Suhl in Thuringia. My good friend Axel Eichendorff is the major source for what information we do have. Gustav and his business is first mentioned in 1888 and in the Jan. 1, 1893 edition of the Deutsche Jäger Zietung an advertisement appeared for his firm and is reproduced here. Axel notes that they advertised as makers of hunting and target arms, specialists in producing drillings, cape guns, garden guns and doing repairs. They were most likely gunmakers to the trade making “economy” guns with no name which would be sold by wholesalers and country gun shops as well as guns bearing the name Gust. Meffert. The firm went bankrupt in 1926.